JB Bakery began as a bagel and bread shop in 1952. Over time, ownership passed from family to family, and the product line increased. 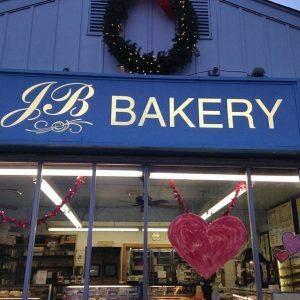 Thirteen years ago, Burlington native Stephen Simon purchased JB and made it what it is today: a local landmark and dessert lover’s paradise that is regularly voted one of Burlington County’s best bakeries. Although JB may have originally stood for “John and Bill” — the bakery’s founders — Mr. Simon sees it as “Always Just Baked” because it operates 24 hours a day to produce fresh-baked products. At JB, professional bakers and pastry chefs employ traditional methods to perfect the art of dessert-making. They use scratch mixes and high-quality ingredients free of preservatives and imitation flavors, with the human element involved from creation to consumption. The bakery offers hard-to-find specialties from all over the world, holiday delicacies, seasonal specials, fresh bread and rolls, a coffee bar, and exceptional service. The chefs design custom cakes for weddings, birthdays, anniversaries, Sweet 16s, Bar and Bat Mitzvah, holidays, reunions, and many other occasions; by establishing relationships with customers and listening to their ideas, JB’s all-star staff turns cake dreams into reality. Through the years, JB has become a Burlington County landmark. It is annually featured in the local news, and people visit from out-of-state to tour the facility and taste the sweets. Guests cherish walking in and experiencing the rich aroma that is unique to real, old-fashioned bakeries. A few years ago, JB gained fame for introducing its ever-popular “Whale Cookie,” a sugary delight inspired by the brave beluga that swam the Delaware River. The bakery was especially honored to host Food Network Chef Robert Irvine for an episode of Dinner Impossible — entitled “Nightshift: Impossible” — during which Irvine used JB’s old-world techniques and machinery to pull a culinary all-nighter. Above all, JB is a family bakery and a part of the local community. Generations have come to regard it as “their” bakery, and it is common for people who grew up with JB birthday cakes to feature JB at their weddings as well. It is the official bakery of Burlington’s Wood Street Fair and supports other local events such as Festival of Lights, Bike Night, and the car show. JB frequently makes gift and product donations to local organizations and fundraising efforts, and it creates jobs for community members. JB Bakery — your bakery, where everything is always Just Baked, and people are always smiling.